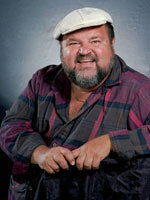 Dom DeLuise, the porty actor-comedian whose affable nature made him a popular character actor for decades with movie and TV audiences, as well as directors and fellow actors has died. He was 75. Thank you Melinda.I liked him, sad. RIP Dom. You will be missed. What a great American icon he was. Sadly noted. Thanks Melinda. It's a reminder that even money can't buy immortality, may he rest in peace, he sure brought a lot a laughter into an otherwise gloomy world!!! May we all strive to be remembered for the joy we brought, the good we accomplished, he sure will be!!! Long live Dom's legacy!!! RIP, Dom, and thanks for all the laughs. Bless your heart and soul dear Dom. Thank you for the years of love, life and laughter. You used too make me bust out with the giggles everytime you laughed. Your laughter was contageious, and sometimes I would laugh until I cried. he touched my heart with His beauty of spirit! You could always tell He was special! I will never forget Him! Thanks Dom for the many laughs and joy you gave to all of us. Rest well dear Dom. He was the funniest guy I ever had the oppotunity to meet! Great cook, great sense of humor, just a jolly guy! He will be missed by one and all! Cheers, buddy! Thanks for all the good-natured craziness & laughter, Dom. Glad we shared the same kalpa. RIP Dom. Thank-you for the great amounts of laughter, food and joy you brought into our lives. You will be missed. I love you Dom. Always enjoyed your warmth & humor! You will be greatly missed! Now the angels can roar with laughter! Who ever said that good guys die young never knew or met Dom. Thanks for the love, laughter and food. Thanks for the laughs Dom. RIP. A great comedian..actor..and a wonderful man..
Dom's laugh was highly contagious! and I'm so sorry that he's passed.